papered over on Russian TV, reportedly incensed Putin, who has staked so much of his personal capital on these Games). There was also the order to slaughter the city's ubiquitous stray dogs. But most spectacular have been Sochi's Potemkin hotels, with unfinished rooms and hallways, unsafe water, cardboard doors, now infamous multi-person toilet arrays, weird electronics in the showers, and oh so much more. Outside, there are abandoned construction sites, gaping manholes, and dead grass painted green. (Galleries here, here, and here for the curious.) Oh, and who could forget those guards. No doubt the journalists and athletes and few fans in attendance will continue to document more as the Games progress. 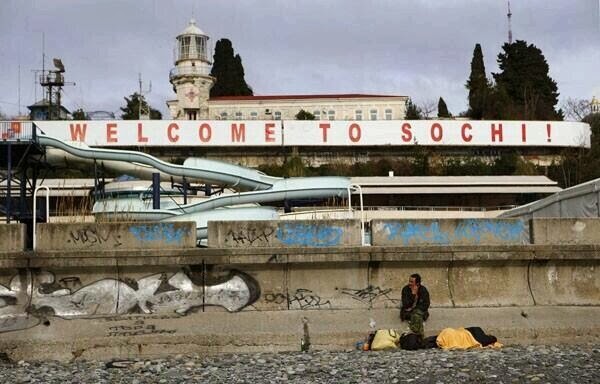 But as I boycott the broadcasts and instead enjoy the #SochiProblems from afar, I try to remain conscious of an important fact: while Sochi's problems may be entertaining from back home, they are real problems that most of the world's population face every day. I feel fortunate not to live in—no, let me rephrase—not to come from a country with pervasive Sochi Problems (which is not to say the US doesn't have any). But most of humanity is not so lucky. Petty corruption to grandiose fraud, pathetically low standards and gross incompetence, lack of regulation and government's lack of respect for citizens—these are the everyday problems, large and small, that make daily life miserable for average people in many countries. The value of the Sochi Olympics—and the global scrutiny they are drawing to this sad little corner of Russia—is their ability to reveal, however briefly, the disaster of governance that exists in Russia, like in many other places. Putin and his thugs should be embarrassed at how bad they look—particularly after spending $50 billion of Russian taxpayers' money to get to this point. And a lot of other governments around the world should experience the same shame at seeing their poor performance in the spotlight. If they do, perhaps a few will change course. So let's keep shedding light on the world's Sochi Problems. Laughter may just be the best medicine.